One of the things we try to preach here is the idea that you don’t need to pay a lot for great tone. Many players who aren’t satisfied with their tone blame it on “cheap” equipment, instead of putting the time and effort into improving their sound with what they have. That being said, we’ve compiled a list with, in our opinion, four of the best budget overdrive and distortion pedals. Electro-Harmonix Nano LPB-1 Linear Power Booster – The Linear Power Booster by Electro-Harmonix uses the same circuit as the original LPB1, and is perfect for gigs. It’s great when you need to boost yourself and cut through the mix for solos, or you can leave it on for a permanent overdrive. It features true-bypass, so it won’t color your tone when you’re not using it. A boost knob controls the amount of gain, allowing for lots of variation. Digitech Screamin’ Blues Overdrive/Distortion – For playing blues on the cheap, this pedal is incredible. It responds very well to playing dynamics, so playing lightly will provide a slight overdrive, but playing strongly will drive it deep into distortion and create intense sustain. It features four knobs – Level – increases output distortion. Low – Adjusts bass frequencies. High – Adjusts treble frequencies. Gain – Sets the maximum level of gain when you are playing your absolute hardest. It also contains two outputs, one for connecting to an amplifier, and one for playing into a mixer. There is a lot of potential in this pedal, and if you play a lot of blues, you must have this pedal. 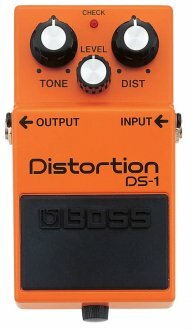 Boss DS-1 Distortion – Not only is this one of the best budget distortion pedals, it’s also one of the best distortion pedals of all time. This pedal has been around for over 20 years, and is still one of the most popular today. It has three knobs, and that is definitely all you need. Tone to adjust the frequencies of your sound, Distortion to increase the maximum distortion when you’re playing hard, and Level for output. If this is the first distortion pedal you ever buy, it could very well be the last distortion pedal you ever buy. Seriously, I can’t recommend this pedal enough. Electro-Harmonix Double Muff – The Electro-Harmonix Double Muff squeezes two Muffs inside one smaller box! Having two muffs at your disposal increases your sonic potential exponentially. It features a single/double switch which lets your choose either one muff or two. The Muff 1 control knob sets the level for the Double Muff, the Muff 2 switch sets the output for the first Muff (Only works in double mode. ), and true-bypass when the unit is off. When the pedal is in double mode, this device has extremely high maximum gain, but in single mode, it can be caressed to dial in just the right amount of distortion. There are obviously several more pedals that could be added to this list, but we felt that the four we choose are more than enough to get you started. If you feel there is one that should have been added, leave a comment and let us know!